Camping Le Dauphin är en camping i Argelès-sur-Mer, Pyrénées-Orientales. Campingen har platser med stängsel och platser med lite skugga. Det finns möjlighet att hyra husbilar. På campingen finns en lekplats och ett sportområde. Denna inspektör gör varje år ett besök på Camping Le Dauphin och inspekterar campingen för ca 200 faciliteter och för andra förekommande punkter. Inspektören är en medarbetare från ACSI och arbetar inte för campingen. Our first stay here and my wife was wondering what it going to be like, we had stayed at a Campsite in Canet en Roussillon for 15 years but they did not treat us well on the last visit and the pitches were unkempt. From arrival at reception where the staff were very pleasant and informative, the sight of the swimming pools as we went back to our car, the manicured local planting around the site ,then our pitch with fantastic views of the mountains and our own private toilet and shower. Well her smile was so large! a great site when we were there in early summer. We shall be going back there, so proof that its of our high standards. Great swimming pools, nice small shop on site things are always slightly more expensive, just like a corner shop at home! They also advised us where the best place was to get some things they didn\'t stock. We have not rated the entertainment as we didn\'t go to any, as we were out and about. An excellent example of a campsite that others should aim for. Easy to find, access is very good for big motorhomes. Cycle path outside main gate goes to beach about 1 km. campsite is very well kept, Tarmac roads clean and grass on pitches cut. Lovely campsite. Beautiful plants, trees and flowers. Good sized pitches (a large number with private bathroom). Beautiful pool area. Good restaurant, but limited vegetarian choice. Bus stop at entrance to site. Only a couple of minus points for us - 1. the lack of a motorhome service point which means using bowls and buckets to empty the waste tank (a minor inconvenience I suppose but still annoying) & 2. Filling up the fresh water tank from the push button taps took ages and requires special tap adaptors. This is a great campsite, staff really helpful and friendly. We chose a pitch with own toilet and shower facilities which was fantastic as my husband has mobility problems. Once we had chosen pitch, the toilet/shower block checked for cleanliness. Great pool and there seems to be plenty for children to do. Will definitely come here again in future. Everything about this campsite met my needs and the staff and animation team are AMAZING! I've made so many friends and memories here in the past 6 years! I would strongly recommend this campsite to everyone who wants to create fantastic memories in the South of France! Chose this site because of the private facilities on the pitch and I was not disappointed. Hard to find a negative. Very pleasant and friendly reception staff. Beautifully maintained site with all you would need, especially if you are travelling with children. Apart from on site restaurant you would need to travel into the town, which is a short distance, for further choices. Good cycling in the area. Would definitely return if I was to visit this area again. This was our second visit to this site. Its absolutely fabulous. Also had our own private bathroom on site which was very useful. Swimming pools were excellent - warm in late May. A useful supermarket on site and a pleasant cycle ride into town. The girls on reception were most helpful and a delight to speak with. Hope we can come here again. Lovely campsite in beautiful surroundings. The best facilities we have found in 45 years of camping. Very friendly,helpful staff and children are well catered for. Prices compare to other Mediterranean sites and a bit cheaper than Spain. We prefer to camp nearer to the beach but hope to come again next year when our family will be here. Top marks!!! The three swimming pools, one with hydro massages, jacuzzis and slides, one for small children and one for lane swimming and excercises, were excellent. The gardens and surrounding area were kept in immaculate condition. We had a pitch with its own toilet and shower, all very good condition and very clean. Access to the pitches inside the camp was very good and on level ground. Restaurant was excellent. Beaches just a short drive away and very good. All in all, an excellent campsite and anyone travelling in the area of Argeles Sur Mer this is a must stay. Vill du boka campingen Camping Le Dauphin eller få mera information? Det går bra med nedanstående uppgifter eller via campingens webbsida. 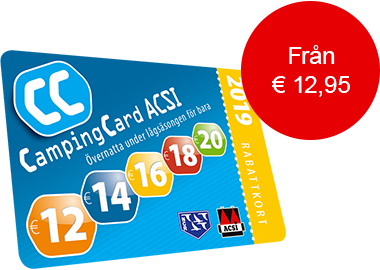 ACSI Eurocampings skickar din informationsförfrågan till "Camping Le Dauphin".